Providing a superior level of informed, professional real estate services to Buyers, Sellers and Owners in the greater Oklahoma City area. 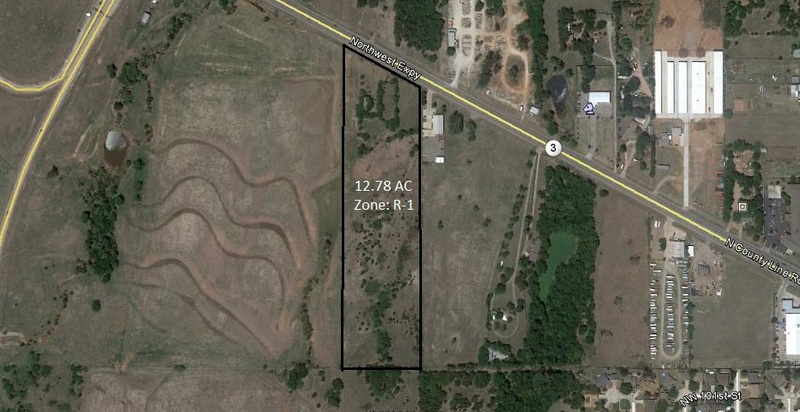 This plot of land is 12.78 Acres, 389' X 1,500', and is zoned as R-1, but could be rezoned to Commercial or Industrial. This property is on N.W. Expressway, with 389 feet of frontage, between Kilpatrick Turnpike and County Line Road and is unobstructed to traffic. The traffic count on N.W. Expressway is estimated to be over 21,000 cars daily in 2013. This land has excellent linkage, visibility, and high customer potential. Even though the property is zoned as residential, this parcel has great potential for commercial or industrial use. President and Managing Broker of Michael Biddinger Real Estate, Inc., Michael started his real estate career in 1973. His Accounting background insures that the firm provides the high quality financial reports expected by Owners of income producing real estate. In addition, his marketing expertise allows us to provide a very thorough and individualized strategic plan for each property, a very essential item required in today's economy. His experience includes development, financing, construction, disposition and operations of over forty major apartment complexes, hotels, office buildings, warehouses, shopping centers and residential land developments. Michael Biddinger Real Estate, Inc.
MBRE takes a proprietary interest in each of our client's properties. We treat your property as if it were our own.